Today I'm sitting in my little yellow car in a spot I've not podcasted from before. High up on the edge of the valley where I live, I'm enjoying exploring somewhere new and explain where I've been for the last few weeks and why I've decided I need to take a sabbatical for a few months. 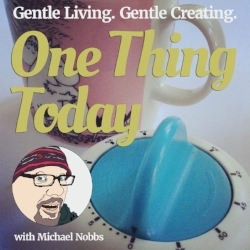 I'm hoping to be back with the next episode of One Thing Today at the beginning of July.